Mother’s Day is just around the corner and while shopper’s scramble to find the perfect gift for their Mom, Cleveland Golf and THP have decided to make life easier for you. Forget the mall, the corner jewelry store or even picking up the card, because the winner of this contest will have this set shipped to them in time for the big day. Then all you have to do, is have a tee time ready and make this year’s special day that much better. Play your own way! 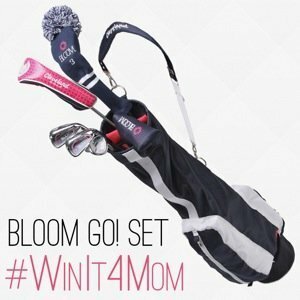 Cleveland Golf’s Bloom line now features the Go! Set for casual players who love the course experience. All Bloom clubs are designed with today’s modern lightweight, oversized technology for increased distance, forgiveness and fun. Bloom Go! is a 7-piece set including a light, stylish bag that’s easy to carry for a relaxed day at the course or range. 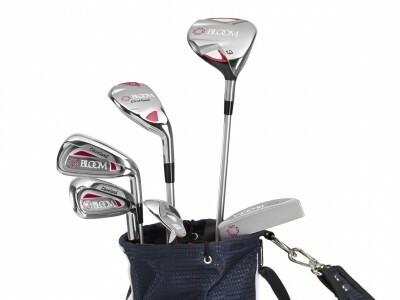 Also available is Bloom Max, a more traditional set that includes 10 clubs and a cart bag. When you’re ready to grow your game, individual Bloom products are available for purchase, including the Niblick, 7 wood and a wristlet. The deadline of this contest is Thursday May 9th, 2013 at 2pm EST. All entries must be received by then to be considered. You can enter the contest two ways. Step 1 – Leave a comment in the section below about why would you like to give Mom, this wonderful Cleveland Golf gift on Mother’s Day. Please include your Twitter handle in the comment as well. Step 2 – On Twitter, follow both @ClevelandGolf & @hackersparadise. Then, send out a tweet about the contest; You must include these 3 things in the message: @hackersparadise @ClevelandGolf & #WinIt4Mom. I’d love to win this for my mom! She used to play a long time ago, but raising 4 boys doesn’t leave a lot of time for golf. Now my dad has started playing with me and one of my brothers. My wife plays a little and the next step is getting my mom back out there. It would be so awesome to play a foursome that included both my parents and my wife! I would love to give this to my mom because it would give her a chance to enjoy the game that all 3 of her sons enjoy. It would also round out our foursome!